The quest for new materials: Can any insulator become topological? Figure 1. This digram illustrates a fundamental difference between insulating and conductive materials. In a conductor an electron, depicted by a gray circle, can move to the conduction energy "bands" freely because there is no forbidden region (gap) present. Insulators have a gap large enough that electrons cannot make the jump to the conduction energy "band". Thus, there are not electrons with energy associated with this "band" (shown here as an empty box). 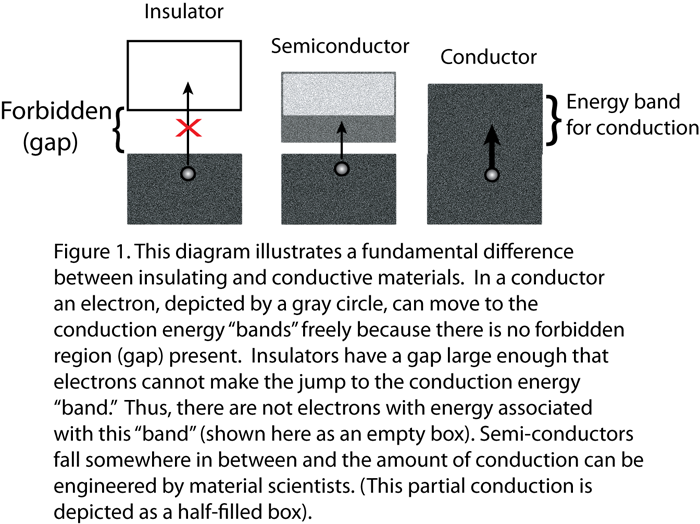 Semi-conductors fall somewhere in between and the amount of conduction can be engineered by material scientists. (This partial conduction is depicted as a half-filled box). Figure 2. Upper Picture: Cartoon depicting the quantum Hall effect with edge states that conduct electrons, shown as half-circle arrows along the boundary. The electrons in the middle or bulk of the material are localized around parent atoms. This region is an insulating state. Lower Picture: Calculation from the authors (from Fig. 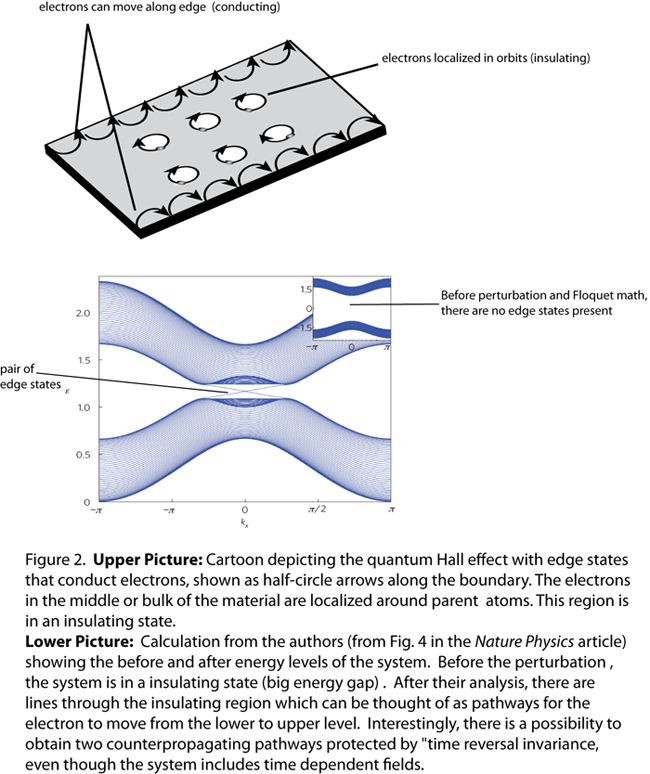 4 in the Nature Physics article) showing the before and after energy levels of the system. Before the perturbation, the system is in an insulating state (big energy gap). After their analysis, there are lines through the insulating region which can be thought of as pathways for the electron to move from the lower to upper level. Interestigly, there is a possibility to obtain two counterpropogating pathways protected by "time reversal invariance," even though the system includes time dependent fields. Figure 3. 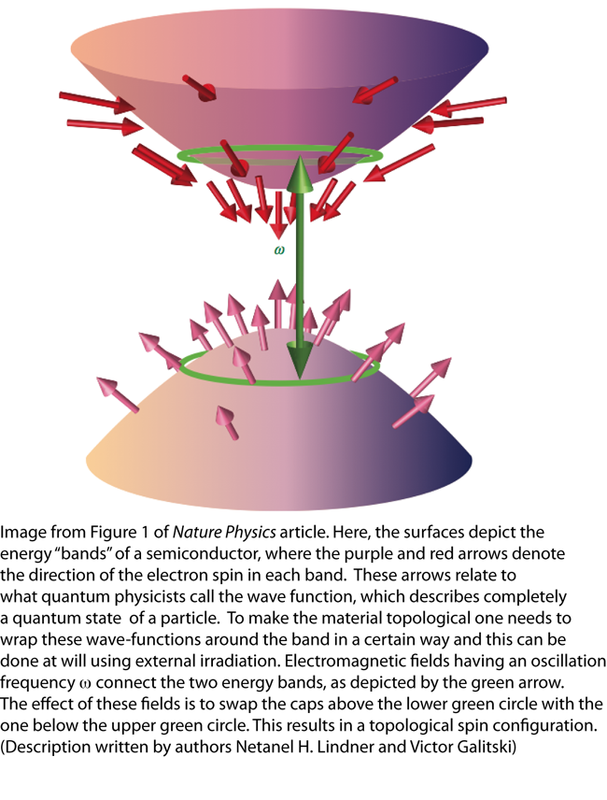 Image from Figure 1 of Nature Physics article. Here, the surfaces depict the energy "bands" of a semiconductor, where the purple and red arrows denote the direction of the electron spin in each band. These arrows relate to what quantum physicists call the wave function, which describes completely a quantum state of a particle. To make the material topological one needs to wrap these wave-functions around a band in a certain way and this can be done at will using external irradiation. Electromagnetic fields having an oscillation frequency ω connect the two energy bands, as depicted by the green arrow. The effect of these fields is to swap the caps above the lower green circle with the one below the upper green circle. This results in a topological spin configuration. Researchers at the Joint Quantum Institute (JQI) and the California Institute of Technology have shown that it may be possible to take a conventional semiconductor and endow it with topological properties without subjecting the material to extreme environmental conditions or fundamentally changing its solid state structure. In their Nature Physics (appeared online March 13, 2011) article titled “Floquet topological insulators in semiconductor quantum wells,” JQI fellow Victor Galitski with colleagues Netanel Lindner and Gil Refael from Caltech provide theoretical verification that such a transition exists. The key to this prediction, which can be experimentally tested, is the application of microwaves to an otherwise non-topological insulating system. According to the authors, the material can be transformed into what they call a “Floquet topological insulator". As described below, topological states have applications in quantum information science and the new field of spintronics. One aspect of solid-state physics – the study of solid or crystalline compounds – is exploring the electrical conduction properties of different materials. Solids are classified according to their capacity to carry electrical current – that is, to conduct electrons. Depending on the underlying atomic structure of a material, electrons are allowed to have certain energies and forbidden from taking on other values. One description physicists use is called “band structure” (Figure 1), where there are allowed energy ‘bands’ separated by ‘gaps’ or forbidden regions that correspond to a set of disallowed electron energies. Current flow occurs when a gap is small enough for electron(s) to travel between the energy bands. Conductors, like copper wire, have no gap at all and permit motion of electrons. Insulators such as ceramics have the opposite behavior and inhibit the passage of electricity. Some materials like semiconductors fall somewhere in between and their conductivity can be controlled depending on the presence of carefully engineered impurities (dopants) within the crystalline material. That allows them to serve as controllable switches in devices such as transistors, the building blocks of modern electronics. Other exotic materials exist that may not be so familiar, but can also be described in terms of this basic property of electron movement. Topological insulators, a completely new class of solids, are rare materials exhibiting a dual personality in their physical properties: they are insulators in the bulk and conductors on the surface (3D) or at the edges (2D). This behavior in itself is unusual and merits scientific investigation. Even more importantly, topological states are possible platforms for quantum information processing and new types of electronics; thus, scientists are going to great lengths to create them in the laboratory. The term topological is used in mathematics to characterize structures based on whether or not they can smoothly deform from one shape to another. The most common example is that a coffee cup with a handle is topologically equivalent to a doughnut, but not to a sphere, because the hole cannot be removed by deformation alone. In the case of topological insulators, it is not the actual shape of the material but rather the structure of the energy bands that can continuously deform as long as the energy “gaps” (like the doughnut hole) are neither opened nor closed in the process. Scientists often explore the reaction of materials to an external stimulus. In fact, especially fascinating and surprising physics happens under extreme conditions such as in high magnetic fields or at the limit of low temperature – in the regime where quantum-mechanical laws take over from classical physics. For example, superconducting magnets operate at around 4 K, which is 75 times colder than room temperature. Topological insulators are not only difficult to synthesize or find in nature, but scientists find it hard to predict which substances might exhibit these properties. Even though scientists have some hint that heavy atoms are good candidates for designing these exotic materials (because of their potentially large spin-orbit coupling), the number of possible combinations is intimidating if not prohibitive. Researchers have currently identified only a handful of man-made topological insulators, such as an appropriately fabricated 2D heterostructure HgTe/CdTe (layers of Mercury Telluride and Cadmium Telluride) or crystalline Bismuth Selenide. Galitski and co-workers open a new avenue for studying these materials by exploring the effects of adding a time-varying perturbation to a generic insulator. In physics, a perturbation is a small disruption that does not dramatically alter the fundamental description of the system. For example, if a car is traveling forward at 60 mph and there is a crosswind of 3 mph, the car is still moving forward and the wind is only perturbing this motion slightly. The authors show that in the presence of a weak oscillating electromagnetic field (such as microwaves), an insulator initially with no topological properties can be driven to become a Floquet topological insulator. The new state is named for Gaston Floquet, a French mathematician credited with creating the mathematical tools that connect time-dependent and stationary descriptions of the system. When the external fields or perturbations are included in the mathematical description, energy pathways emerge in the “band structure” and allow for electron conduction along the edge of the system. (See Figure 2, bottom panel, for example). Remarkably, the edge channels could be either counter- or co-propagating, depending on the type of field applied to the system. This means that the Floquet topological insulator could be engineered to exhibit either quantum Hall or spin quantum Hall physics. The authors examine different experimental conditions for which the transition to a Floquet topological insulator can be observed. According to their results, the most promising perturbation method is to irradiate the material with magnetic or electric fields in the microwave-THz frequency domain, relatively easy to implement in the laboratory. “A big picture aspect of this is that topological insulators are extremely interesting materials, and they are very rare. It is not clear how many exist in nature, but this idea of external modulation may help us engineer new materials at will, like a topological switch,” says Galitski when describing the remarkable results. Notably, these exotic states do not require extreme conditions to occur and may exist at room temperature, which makes them amenable for a variety of applications. Many scientists hope that utilizing topological states may help with developing another form of electronics called spintronics. This approach seeks to employ the spin of an electron, rather than just its electrical charge. Topological states may also have applications in quantum information science and quantum interferometry, which could take advantage of these robust edge states. Quantum information is very fragile and can be spoiled easily by an external environment. Interestingly, the edge states of topological insulators, assisted by superconductivity, can be used to store and manipulate quantum information in a manner that is protected from such outside influences. The electrical and spin conduction properties of these quantum states depend on external conditions. In principle, one could build a device that exploits this sensitivity of the quantum edge states to probe external fields (e.g. gravity, acceleration, and static magnetic fields).